Victoria is full of gorgeous country towns and beaches which make for fun day trips and weekend getaways. If you're looking for an out-of-town location which has it all, Lakes Entrance has to be up there for its beautiful beaches, historic parks, boats trips, stunning views and most importantly, amazing restaurants. You're definitely spoilt for choice when it comes to eating out in Lakes Entrance, with an array of venues boasting some of the freshest and tastiest seafood. If you're heading over there, it's worth doing some research and booking a table in advance. Making the most of the lakeside location is one of "The Entrance's" best charms. A trip to The Floating Dragon is a must while you're there. Situated across a bridge, and floating in the water, it's the perfect water location, without that boat-rocking feeling which isn't the most fun if you're eating. The menu is full of delicious and decadent options of contemporary Asian cuisine, all designed to share. The pork belly is cooked to perfection, and all the calamari dishes are mouth-wateringly tasty. I'd love to tell you about the desserts, but there definitely wasn't any space for it! The Floating Dragon definitely provides a satisfying meal and unique dining experience. A trip to Wyanga Park Winery and Henry's Café is essential in Lakes Entrance, the friendly staff make you feel at home as soon as you enter, and they serve up a range of lunch and afternoon tea treats, including homemade scones with cream and jam, a truly indulgent dish that makes this place special. 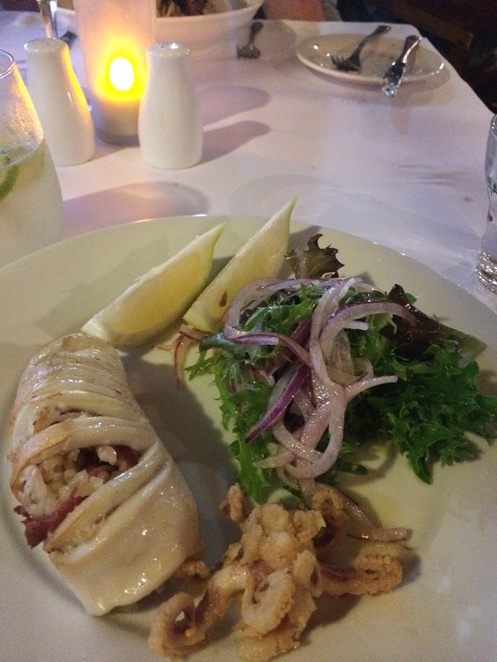 It's important to indulge in seafood in Lakes Entrance; both Miriam's Seafood Restaurant and Ferryman's Seafood Cafe do this well so I won't pick a favourite. Miriam's signature dishes include their seafood marinara, Moreton Bay bugs, and calarami stuffed with paella rice and prosciutto. Ferryman's favourites include their signature fish and chips, and seafood jambalaya to name a few. Both venues do incredible seafood platters to share, great for trying everything. Another favourite is the lavish, hatted restaurant, The Boathouse, also worth a visit. If after all that you can fit in a sweet treat (of course you can), stop by Mmm Truffles, an iconic chocolate café, with one of the biggest range of homemade truffles and decadent flavoured hot chocolates, from coconut and honeycomb, to hazelnut and Turkish Delight, the choices are impressive. If you don't return from Lakes Entrance with a bit of extra weight, you didn't do it right. Once you've eaten your weight in seafood and chocolate, relax on the stunning ninety mile beach on your way back, with some quiet and secluded spots for a truly relaxing trip. Thanks for the info. We had a wonderful trip to lakes entrance made better by informed choices. We also recommend the floating Chinese restaurant, great advice and a must do restaurant. The wyengra Winery serve the most delicious scones and Devonshire tea is fairly priced. Mini golf's and ice cream parlours kept the kids pacified.